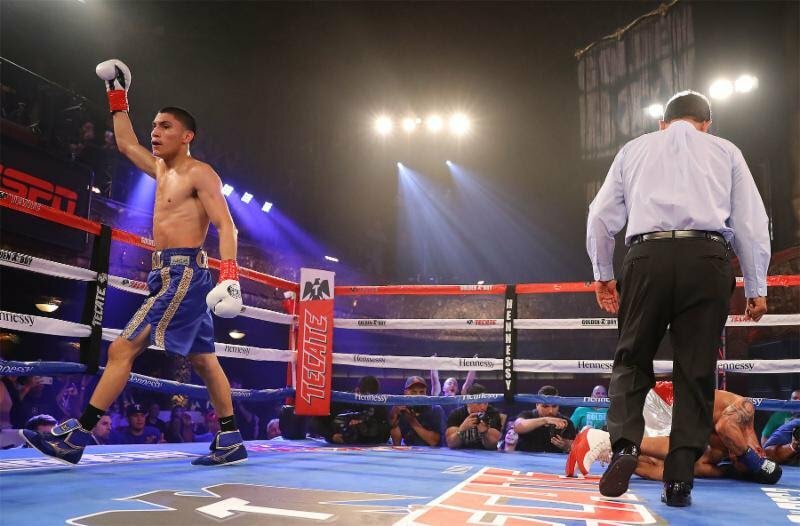 Vergil Ortiz Jr. (10-0, 10 KOs), the rising knockout artist and pride of Dallas, Texas, scored a spectacular third-round knockout win against former world champion Juan Carlos Salgado (27-9-1, 16 KOs) in a 10-round super lightweight fight in main event of the June 23 edition of Golden Boy Boxing on ESPN at the Belasco Theater in Los Angeles. After punishing Salgado for two rounds, Ortiz ended matters at 1:52 of the third round with a thunderous left hook to the body. Super Featherweight prospect Hector “El Finito Tanajara Jr (14-0, 6 KOs) of San Antonio, Texas scored an eight-round unanimous decision victory against tough Venezuelan Roger Gutierrez (18-2-1, 15 KOs) in tonight’s co-main event. Despite Gutierrez having an awkward style, Tanajara won with scores of 80-72, 79-73 and 78-74. Rising 154-pound prospect Ferdinand “Lucky Boy” Kerobyan (9-0, 5 KOs) of North Hollywood, Calif. scored a second-round technical knockout victory against Edgar Garcia (7-17-1, 2 KOs) of Sonora, Mexico in a super welterweight fight that was initially scheduled for six rounds. Meiirim Nursultanov (20-0, 6 KOs) of Merki, Kazakhstan scored a sixth-round technical knockout victory against Josue Obando (15-21-1, 12 KOs) of Guadalajara, Mexico in a scheduled six-round super middleweight fight. After dominating Obando in every round, Nursultanov stopped Obando at 1:37 of the final round. Ortiz Jr. vs Salgado was a 10-round super lightweight fight presented by Golden Boy Promotions. The event was sponsored by Tecate, “THE OFFICIAL BEER OF BOXING” and Hennessy, “Never Stop, Never Settle.” The fights took place on Saturday, June 23, 2018 at the Belasco Theater in Downtown, Los Angeles, Calif.